Around 18mi (29km) away from the northeast of the city proper, Jinan Yaoqiang International Airport is at the Yaoqiang Town, Licheng District. Jinan Airport was opened in 1992, and now is the largest civil airport in Shandong Province. Its passenger throughput ranks the second in Shandong following Qingdao Airport. The terminal building covers about 27 acres (11 hectares), equipped with 24 boarding bridges. The airport mainly serves the west and central areas of the province, including Jinan, Zibo, Tai'an, Liaocheng, Dezhou, Binzhou, Jining and Heze. It is the base airfield of Shandong Airlines, China Eastern Airlines and Shenzhen Airlines. Note: Tickets for all the buses can be bought on the spot at the ticket counter. It is no need to book in advance. I will take an overnight stopover. Can I stay there for a night? It is not allowed to stay overnight. The terminal building will close after the arrival of the last flight. For your overnight layover, you can consider staying in the Airport Hotel which is about 500yd (460m) north from the terminal building. Dial the 24-hour service hotline 86 0531-88730888 to book a room and ask for the pick-up service. My flight takes off 11:00am. When should I arrive at the airport? Is it a domestic or international flight? Generally, it is suggested to check in 90 minutes ahead for domestic flights and the check-in counters will be closed 30 minutes before the flight takes off. To catch an international flight, you need to arrive at least 120 minutes in advance, and the check-in counters will be closed 45 minutes before the flight departure. May I know if self-service check-in machines are available? Yes, 12 self-service check-in machines are equipped in the waiting hall. Passengers can check in there and print the boarding pass. I'd like to visit Jinan for half a day during my stopover. Can I leave my luggage at the airport? Yes, of course. In the Arrival Hall, you can find the left-luggage counter. It costs CNY5-10 for one piece. I lost a purse in the airport. Can I get it back? Is there lost and found service? The Lost and Found Counter is between Gate no. 4-5, Domestic Departure Hall. It is open from Monday to Friday and the service hours are 09:30 – 11:30, 13:30 – 15:30. The consulting hotline is 86 0531 82086359. To retrieve the lost item, you should make a reservation first and present the passport on the spot. If someone else is entrusted to collect the item, the passports of both of you and the copies are required, as well as an authorization letter. If I am faced with problems, where can I ask for help? The general information desk lies in the west of the Domestic Departure Hall, 2F. Questions about flight schedules, direction guiding, luggage storage, copying & printing, public telephones can be consulted there. Where can I exchange RMB for my trip in Jinan? There is an Industrial and Commercial Bank of China as well as its ATM in the south of 2F for your convenience. Besides, next to Check-in Counter No. 41, you can find the dedicated currency exchange counter. Is first aid available at the airport? Yes, the first aid room is in the south of 2F. Besides, the well-equipped medical center is only 0.6mi (1km) from the terminal building. If there is an emergency, call for help by dialing 86 0531-82086511. 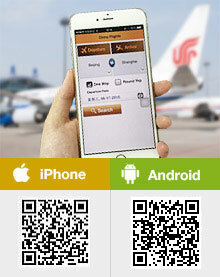 I need a taxi to go to handan east railway station from jinan airport on 8th april, monday, 6am. Is it possible and what are the approximate charges? We are 2 person with 2 suitcases. I’m afraid not since they are in different cities. You need to take a high speed train from Jinan East Railway Station to Handan East Raileay station, which takes about 2.5 to 3.5 hours. From the airport to Jinan East Railway Station, you can take a taxi, the fare is about CNY40. I was wondering if I needed to buy bus tickets in advance to Zibo from the airport. Chinese new year is coming and I am afraid what if all the tickets are sold out prior to my arrival. There is no booking page of the airport shuttle bus. Thus you are advised to arrival early and purchase the tickets when you arriving at the airport. Do we need to go security check again as we have to go from arrivals to departure at Jinan airport? Any idea do we have to go security check again as Shandong airline will handover the baggage to us during the next connecting flight of Shandong after 7h? I think if we have to go to collect our baggage then we have to go immigration during the moment we go for baggage collection and then moving towards departures after receiving baggage? Hi Skt, as I know, if it is an international to domestic transfer, you need to collect your baggage. And then you need to go immigration. But you are advised to consult the airport staff to confirm that. night layover 7h at Jinan Airport. if don't opt hotel, can stay inside airport? I have 7 h night layover at airport via Shandong airlines for an international flight. if don't opt hotel, where I can stay? Can I sit inside the chairs/benches inside the airport or the airport is completely closed? If airport is completely closed, and if we go outside then we need security check again? Don't worry, Skt. As I know, the airport opens for all day around. There are four shuttle buses departing from the airport at 11:00, 13:30, 16:30 and 18:00.